In a two- or three-player game, all players play with two characters each. The game is played normally, except that each player has two turns each round (one turn for each character). Players do not have to separate their gold or their districts between their characters, as the players still only have one city. A player can, for example, keep the money earned by his first character to build an expensive district with his second character. The player who has the Crown marker (Player A) shuffles the Character Deck and places a random character card facedown in the center of the table. He then secretly selects a character card from the remaining cards and passes the remaining six character cards to the other player (Player B). Player A selects one of the remaining four character cards for himself, and then he chooses and places another character card facedown in the center of the table. He then passes the remaining two character cards to Player B. The player with the Crown takes the Character Deck, places a random card facedown in the middle of the table, and then secretly chooses a character for himself. He then passes the remaining character cards to the player on his left, who also chooses a card, and then passes the remaining cards to the left, etc. 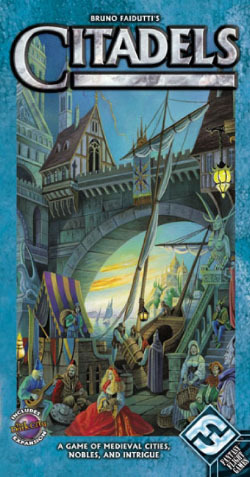 This continues until each player has chosen two cards from the Character Deck. The last player selects one of the two remaining cards and places the last card facedown in the center of the table. During the "Choose Characters" step of a seven-player game, when the seventh player is handed the last character card from the sixth player, the seventh player secretly looks at the facedown card on the table. He then chooses one of these two cards, placing the other card facedown in the center of the table and allowing no other player to look at it. If players agree, the game can be made shorter by playing to seven districts instead of eight.